If you did not get your Spread the Love heart on Tuesday in the quad, come by Thurs and Friday to pick it up. See an ASB member. High School Indoor Soccer sign ups happening NOW! Come by ASB for more info! Class of 1963 Reunion weekend...October 19-20th. Hope to see you at the Homecoming Game! HOCO dance tickets will only be sold at the ASB window until Noon on Friday. You can still buy at the door! All the HOCO Info you need is right here! Take a look!
" No Place Like Homecoming" tickets will be on sale Monday 10/15. Dance contracts and guest passes available now. CMHS is sponsoring a SAT Bootcamp through Revolution Prep! When: Three day test preparation course or "Bootcamp"
How: Complete the attached registration form and submit it to Mrs. Krikorian in the College & Career Center (akrikorian@nmusd.us) before October 19! Notes: Students will be registered first-come-first-serve until the program is filled. See attachments for more information! The course will be offered free of charge, but seating is limited. Please only register if you intend and are able to be present at all sessions. The sign up link for SoCalVegFest Volunteers is now available. Please kindly click the link to sign up your desired shift(s). After you sign up, the volunteer coordinator will send you a confirmation email shortly. *All volunteers will receive a FREE T-shirt and a weekend pass. *All FRIDAY volunteers will receive a food voucher. *All volunteers who do two or more shifts on SAT/SUN will receive vouchers. *All volunteers who do two or more more shifts (FRI/SAT/SUN) will be invited to Monday night's exclusive dinner party. (Oh... yeah)! *All volunteers will receive raffle tickets - one ticket per shift PLUS one ticket for bringing in your signed, printed WAIVER FORM when you check in. We will have many prize drawings this year as an extra token of appreciation!! Club Rush will be Thurs and Fri 10/11 and 10/12. Come out to the lower quad and learn more about our awesome programs. Food will be available for purchase Friday. 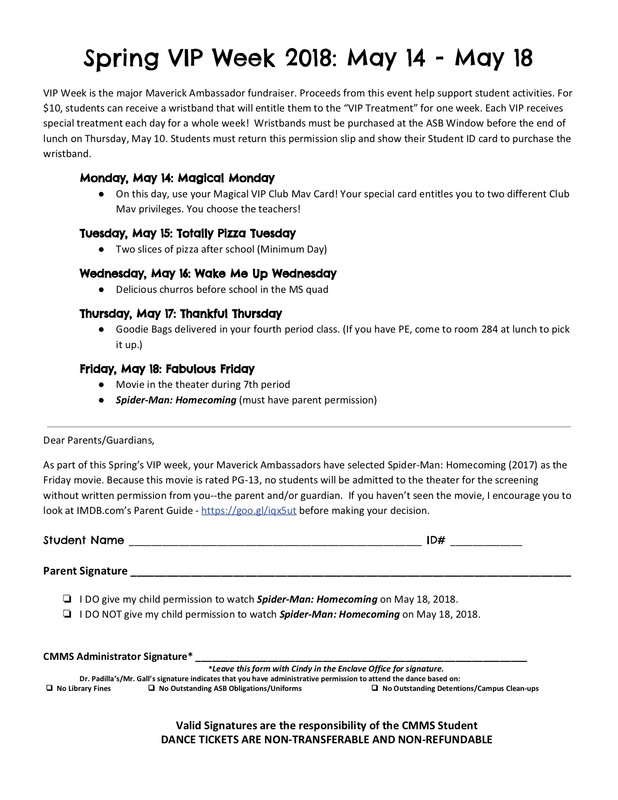 Homecoming guest passes are available now! See attached or visit ASB. Dance Contracts will be next week. Totally Tiki will be Friday, September 21, from 6:00 p.m. to 8:00 p.m. Dance tickets are on sale at the ASB window now through Thursday at lunch. Tickets are $5 with ASB or $10 without or at the door! Don't forget your ID Card and a signed Dance Contract to buy your ticket. Dance Contracts are available at the ASB window, in the Middle School office, and in room 284. Join us this week as we celebrate our new school year with theme days! Friday, September 21 - wear Hawaiian print shirts/dresses and come to the dance! NEW INFO: Saturday Orientation Added: Volunteer at Priceless Pet Rescue! WHAT: Volunteer jobs include animal care, dog walking, animal socializing, cleaning, pet transport, adoption events, and fostering pets at home. WHEN: Morning & afternoon shifts will be available; shift sign ups will be on-line. “Priceless Pet” volunteer t-shirts will be available at orientation for $5 each. 9/13 Cool On-Campus STEM Opportunity! All students interested in learning more about aviation and STEM careers. U.S. Army Aviation Adventure (a 60 foot, 30 ton trailer that incorporates several interactive exhibits) on our campus! Did you know the Army has more aircraft than any other branch of the service? All students are welcome to come and experience a myriad of interactive Army exhibits to include; Kiowa Helicopter simulators, Apache Helicopter Simulators, Unmanned Aerial Vehicle Simulator, Immersa Domes with different scenarios, and Touch Screen Computers loaded with the latest Career Navigator (CNAV) Software. Do you want to have a hands on experience regarding our voting process while also earning money?! CA State Legislature allows high school students to serve as poll works on election day. This is a unique and amazing experience to see first hand how our electoral process runs! You have the opportunity to make a difference even before you can cast your vote! You can also receive a paid stipend of $120! Please see the attached documents for more detailed information and consider being a participant of this unique opportunity! The application is also attached to this email. If you are planning on applying to a four-year university you will need to take either the SAT or ACT(or both)! The deadlines are listed below. The ones highlighted below are fast approaching, register ASAP! We recommend you complete at least one test by the end of December. If you need a fee waiver please stop by the College & Career Center/Counseling to pick one up! Need more info about testing? Check out our testing webpage! GET COMMUNITY SERVICE HOURS RIGHT NEXT DOOR!! All students will receive community service hours. Please bring a community service form with you to the event! FREE College Essay Workshop for Seniors! Register for this FREE event online! Additionally, please complete the attached registration form and bring it with you to the event. There is NO COST for this workshop, but students will need parent permission to participate. Attention all High School Students! The Back to School Dance is Friday 9/7 after the Football game! Dance contract attached. Come to the lower quad after the game and start the school year off dancin'! It's almost time for school to start! If you're a middle school student, here is a list of the supplies your teachers think would be helpful for you to have! Please let one of your teachers know if you have difficulty obtaining these items! All new to CMMS students are invited to attend Camp Mav on August 21, from 1:00 - 3:00. CMHS Class of 1978 40 year Reunion! Are you undocumented? Did you complete the California Dream Act Application? If yes, you must submit an AB540 Form (see attachments to download PDF) and your official transcript to your college/university's enrollment office (CSU, UC, & Community Colleges). Your college may have already notified you about this, but we wanted to remind you so you will be set for Fall 2018! Request an official transcript in the Counseling Office today! They will be ready for pick-up on Wednesday June 27. Come to the College & Career Center if you have questions! Students need to arrive at Mustangs Field by 8am. Students will receive their specific seating assignments at this time. The ASB Office will also be open after 12pm-3pm only for additional tickets. Seniors must park in the student parking lot and walk to the field. The Enclave parking lot and the front staff lot will NOT be open! Graduation will begin promptly at 1:30 p.m. I anticipate graduation ending right about 2:30pm. Family members will NOT be allowed on the field. Graduates will be exciting the Davis School gate and will walk along Arlington to reunite with family in the Middle School Enclave parking lot, please plan on meeting your graduate there. To provide a positive experience for everyone, no one will be allowed to bring balloons, signs or noisemakers into the stadium. Students may not have anything with them on the field. Cell phones, keys and other items should be left at home for graduation. Balloons block the view of people sitting around you and will not be allowed in the stadium. If you are attending a four-year college/university you must request an official transcript. Complete an Official Senior Transcript Request Form in the Counseling Office ASAP. If you are attending a community college you DO NOT need official transcripts to be sent. NOTE: You are limited to five free copies of your transcript. College (Hard Copy- you must pick up, address, and mail) for CSU, Out-of-State, Non Common App Private Schools etc. You have been invited to a special flag deck in your honor Wednesday June 20th. Please see below for your school letter...open yours ASAP! This year's 9-11 " Scholargram" winners....please check out our link attached! Dance Contracts are available in the Enclave Office, at the ASB Window, and in room 284! The last day to buy Prom tickets is THURS! Tickets will not be on sale Friday! The last day for a birthday marquee and balloon order will be Thursday May 30th! We will start up again in the fall. Congrats to Esperanza Hart, our 2018 Talent Show winner! These students have been selected to serve the student body of CMMS next year. VIP Week on Sale Now Through Thursday, May 10! Current 8th graders are invited to purchase tickets for a trip to Dave and Buster's immediately following promotion! Early Bird Tickets are $35 and are on sale through 5/10; Last Chance Tickets are $40 and are on sale June 4 - 8. All tickets include round-trip bus transportation, an appetizer buffet, and a $20 Power Card. As always, a signed Activity Contract is required. Contracts are available in the MS Office, on School Loop, at the ASB Window and in room #284. Cinco de Mesa - a fiesta-style middle school dance! Our next middle school dance is scheduled for this Friday, May 4, in the Enclave Quad! You don't want to miss out! Tickets are on sale now for $5 with ASB; $10 without or at the door. Dance contracts are available in room 284, in the middle school office, and at the ASB window. You can also click the link below and print your own! Ambassador Election Results Are In! Maverick Ambassador election voting will be done in history classes on Thursday and Friday. Please vote for the candidates that you feel will do the best job next year. Juniors & Sophomores! Are you interested in attending a four-year university after graduation? If yes, you need to prepare for taking the SAT or ACT! We will be hosting a three week course that will help prepare you for the June 2, 2018 SAT! Normally a program like this can cost hundreds of dollars, but it will be offered free-of-charge to our students. Spots will be filled first-come-first serve. For details and the registration form, please see the attachments.